Cape Town — An AU delegation met with the Cameroonian government after discussing solutions to the post-election stalemate with Movement for the Renaissance of Cameroon (MRC) opposition leader Maurice Kamto on December 20, 2018, Africa Info reports. The delegation presented President Paul Biya's administration with a proposal that was geared at defusing the impasse gripping the country after the disputed November presidential elections, and also address the crisis in the two English-speaking regions. 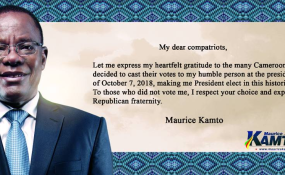 Kamto expressed his reservations about the VP post being linked to presidential succession, preferring that the president choose a running mate for elections. As for the government of national unity, he told the commission that it did not interest his team to be part of a government of "slaves and future prisoners". This did not go down well with the AU delegation but they accepted his stance. This explains why on his return from Addis Ababa, Kamto delivered an "appeasement" speech after he initially presented his proposals for amendments to the Constitution and the electoral code. The reason MRC later took to the streets is because information (reportedly leaked by a Biya government minister) reached the party that the Biya regime did not intend to implement the proposals of the African Union. The government source said Biya's administration is playing for time so that the momentum for change is lost before the March session in Parliament to discuss the AU proposals. The government intends to appoint one of Biya's proteges, Presidency Secretary-General Ferdinand Ngoh Ngoh as the vice-president, according to the government source. Kamto then realized that there are people in the government benefiting from the war in the North West and South West, and it was not in their interest for the war to end. Translated by Michael Tantoh from Africa Info's article written by Kand Owalski .